For this trip we decided to try something new and target Walleye. 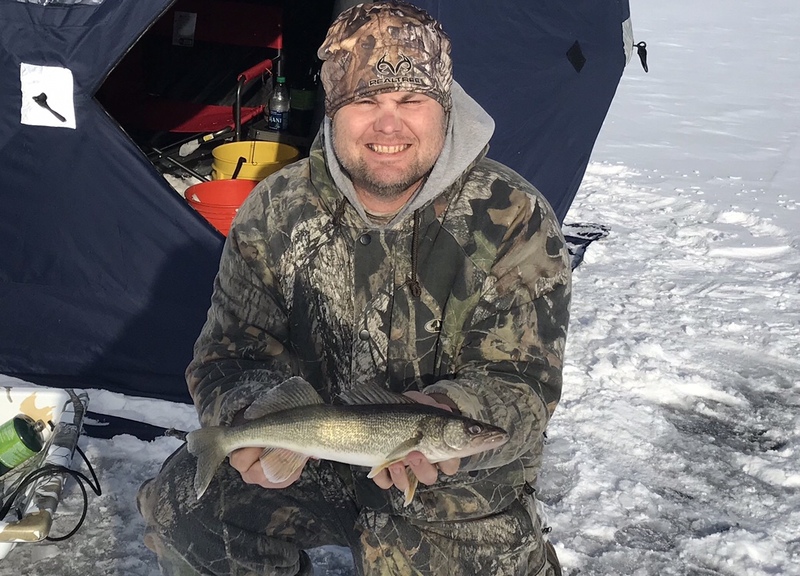 I tend to spend several days every year catching Walleye on lakes and rivers; however, trying to catch them through the ice is something relatively new. We started out by using Navionics to locate a point that had a sharp ledge going from ten feet to fifty feet deep. The ledge was such a fast drop we were able to position the shanty where four holes ranged from twenty-two to twenty-six feet. We decided on that depth after punching a few holes and finding fish on Riley’s MarCum. It took about an hour before Riley hooked into the first fish, which unfortunately came off just under the hole. The good news was that our plan appeared to be working so we stayed in the same spot. Thirty to forty minutes later, Riley told me to get ready because he had seen fish on his machine. At this point we had our minnows hooked through the body so they could swim freely, so I gently lifted up one one of my rods and felt a bump and had one on. That fish measured sixteen and one-half inches. It wasn’t big but was legal size to keep… and now we knew our spot was good! Not too long after that I had another on for a short period of time. The fish took off with it and I hesitated just long enough it wasn’t a good hook set. We spent a couple more hours fishing and at ten o’clock it appeared either the Walleye had shut down or we just couldn’t get them to bite. We spent a couple more hours on the ice with little Perch keeping us entertained. It appeared Riley had caught the record fish of the day until I pulled a double on two fish that weren’t much bigger than the bait we were using. After several hours on the ice we felt a little defeated, but in reality we had a game plan and it worked! We picked a spot and hooked into three Walleye. On our way back in I took a picture of all the people fishing in one spot. I don’t know if that was the place to be or if we were the only ones willing to go further out. It was a lot of work to go as far as we did but I think it was a good decision. Catching Walleye through the ice was a new adventure, and if Mother Nature cooperates, I look forward to trying it again in the near future!